With so many disposable thrillers with the word “Girl” in the title on the market it could possibly be taken a marker of some quality that the title of Bernhard Schlink’s new novel references a “woman”. There are no murders, no unreliable narrators and no sneaky plot twists. The Woman on the Stairs fits more in line with recent books that take the art world as their focus and as a jumping off point to explore deeper issues such as The Last Painting of Sara de Vos (which also, coincidentally, also featured both a stolen art work and Sydney’s Art Gallery of New South Wales). The narrator, an aging mergers and acquisitions lawyer from Germany is in Sydney stitching up a deal when he comes across a painting from his past. That painting, The Woman on the Stairs, was in the middle of a formative event in his life as a young lawyer. The subject of the painting, Irene Gundach, had left her husband for the artist Schmidt and the two men were in a dispute over the painting. The lawyer caught in the middle, found himself falling in love with Irene and helping her to get out of the situation. On seeing the painting many years later he hires a private investigator who tracks Irene down to a remote beach on the NSW North Coast but soon both Schmidt and Gundach are there too. The story is told very much in three distinct acts – the historical tale of the painting and the hunt for Irene, the regathering of the protagonists of that earlier tale, each with their own claims on both the woman and the painting, and the aftermath of that visit. Through this, Schlink explores the role that Irene plays in the lives of these three men and her constant fight not to be defined by them and their needs. As she herself says “roles make you predictable, interchangeable, useable”. It is no surprise that the name she takes when she moves to Australia is Irene Adler, the woman who obsessed and bested Sherlock Holmes. Of course, the stolid lawyer, who “aims for precision in everything I do, sometimes too much precision” prefers non-fiction to fiction, and so fails to see the significance of this pseudonym. In the end, though, Irene remains more of an activator than an actor. The lawyer comments on the fact that she never answers his questions and the reader needs to glean her character from her words and actions. And while she attains ultimate agency, her role in the narrative seems mainly to awaken buried feelings within the narrator and set him free, if only in his imagination, from the path that his life has taken. 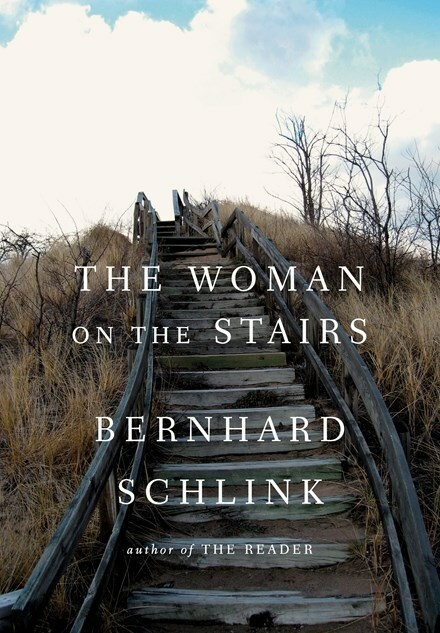 The Woman on the Stairs is set in Australia but is a particularly German view of the landscape and people. Some terms and descriptions that would slide through internationally will be jarring for Australian readers (for example referring to the policeman in a NSW coastal town as the sherriff) and it is hard to know whether the problem is in the original German or in the translation. But given the narrator is himself German, this slippage is forgivable. There seems to be no underlying reason why the action is set in Australia except as a metaphorical way of representing the complete break from Germany both in terms of distance and culture (and possibly for the use of bushfire as both an encroaching threat and goad for action in the third act). The Woman on the Stairs is a thought provoking read. Schlink uses his scenario to explore a number of themes, some more subtly than others, including roles that men cast women in, the ability of people to change their life, the nature of art, the relationship between the artist and their work. And with “Girl” thrillers still coming out of the woodwork, this can only be a good thing.